Forming a new United States Army to favorably compare in size and skill with the battle-hardened armies of Europe was an enormous undertaking. In order to build the camps and cantonments (training centers) required to train and organize the National Guard and National Army (draftee) divisions, the Army Construction Division was formed in May, 1917. 16 cantonments for the training of National Army troops and 16 camps for reorganizing and training National Guard troops were constructed throughout the U.S. 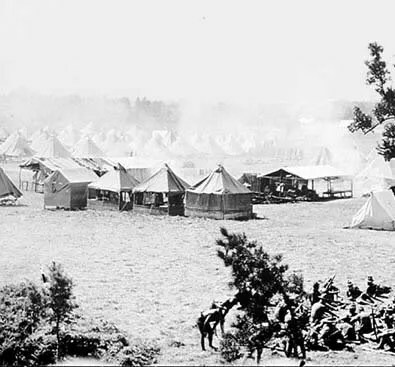 Initially quartering troops in tents with wood floors, these training bases were each able to accommodate a “Pershing Division” of approximately 28,000 men. By September 1, 1917, troops were housed in each of the encampments, but by that time the 26th Division was already prepared to make its way to France. 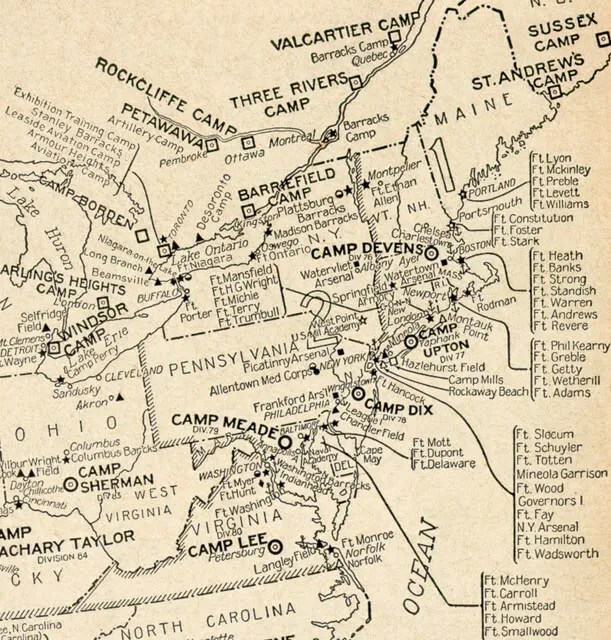 The 26th Division had been quickly organized from National Guard units throughout New England beginning in mid-August, 1917. In his writings Sam Avery indicates that in late July, 1917 the 8th Mass. N.G. was mobilized and sent to existing Massachusetts National Guard training areas, first at Camp Houston in Lynnfield and then at Camp Bartlett in Westfield where it was ultimately dismantled and integrated into the Army’s new divisional structure. 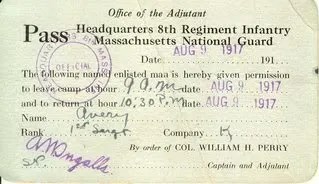 State troops were Federalized on August 5, 1917 and formally integrated into the U.S. Army National Guard structure, thereby losing their former State Guard identities. Camp Bartlett was located about two miles north of Westfield on a site known as “Hampton Plain” along the Westfield-Holyoke rail line. It was closed to visitors except at prescribed hours. On the east side was the 52nd Brigade HQ along with the camps of the 103rd Infantry, 103rd Machine Gun Battalion and Maine heavy artillery. On the west side were the camps of the 104th Infantry and the Depot Brigade. 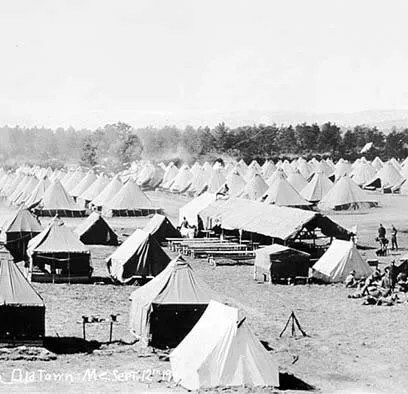 All the troops were housed in tents with a wide open parade and drill ground which had been cleared for the purpose. Each night at Retreat the different Battalions in rotation would hold evening parade. 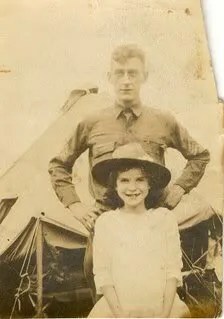 It was from Camp Bartlett in Westfield that First Sergeant Sam Avery then traveled to Hoboken, N.J. with the newly-formed 103rd Infantry Regiment to board the S.S. Saxonia and sail first to Halifax, Nova Scotia and then to Liverpool, England before finally landing at Le Havre, France. in bottom right corner; photo. L Shapiro, 110 Tremont Street, Boston, Mass. any info? is this the Riverside area of Boston? This sounds like a typical panoramic photo of the period and was probably taken in the area of greater Newton outside of Boston. Today there is a large mass transit station called Riverside in that area. N.G.S.M. would refer to the National Guard, State of Massachusetts which was the designation between 1903 and 1917. See the Page entitled “8th Mass. Infantry” for more on the history of the Massachusetts Militia and National Guard.